With over 100 years of experience as the marine propulsion industry leader, Michigan Wheel continues to make the custom-crafted boat propeller you buy off the shelf. The unmatched performance and the wide variety of styles and types in Michigan propellers offer boaters a single source for boat props that are custom made for every kind of pleasure craft in the water. Boat propellers ranging from the marine inboard and industrial fixed pitch propellers, from 3” through 96” diameters — suited for pleasure and commercial markets, all the way to a complete line of aluminum and stainless steel replacement propellers for Outboard and Sterndrive applications. Whatever your particular demands, Michigan Wheel can fit you with the right, hand-crafted propeller. 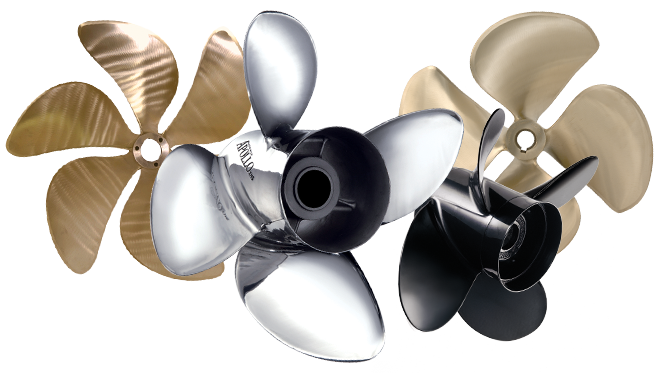 Click below to Use our Prop Guide to find the Perfect Michigan Wheel Propeller for your Outboard or Stern Drive! With a slogan like 'World Leaders in propulsion and marine maneuverability systems,' Michigan Wheel is committed to providing the best marine maneuverability for its customers. Custom crafted boat propellers built by Michigan Wheel are made to fit you. Over one hundred years of experience has honed their business model to be the best blend of machine and hand operations -- an industry wide standard of excellence. Boat propellers for all boaters -- recreational, commercial, or governmental -- come in a broad range of choices with the option to order discontinued parts or get a completely custom rig. With a formal quality control process you'll have peace of mind that you're cruising with a safe and reliable propeller. Inboard propellers made by Michigan Wheel's in-house brand can be used for powerboats, M series, sailboats, mud boats, ski boats, and towboats. Their "M" series propellers are their most economically advantageous propellers without cutting corners. They are certifiable to ABS type 2 and to ABS in NiBrAl. Before final delivery they are inspected by MRI to confirm their manufacturing is flawless. Sailboat propellers are designed to maintain the highest efficiency either under sail or under power. The design of the mud boat propellers is optimal for agility and maneuverability in the weed-choked waters mud boats must power through. Their ski and towboat propellers have been designed to combat the need for high power requirements of use, and help steady thrust to ensure a smooth ride. Use the Below Form to submit a request for an Expert Michigan Wheel Inboard Prop Sizing by our Experts! Vortex XHS Series, Michigan Match, Ballistic Propellers, Apollo XHS Propellers, and are all brands of outboard propellers made and supplied by Michigan Wheel. The Michigan Match propellers are designed for engine brand specific propellers, reducing the need for a custom propeller -- some engine brands include Honda, Force-Chrysler-U.S. Marine outboards, Nissan-Tohatsu, Suzuki, Yamaha, and Volvo. Ballistic Propellers are all made from stainless steel and designed for engine brands, or engine specific power, V6/V8 for example. Vortex XHS Series offers most of their propellers in a three or four blade option, based off your needs. Propeller Depot carries the entire line of inboard and outboard Michigan Wheel Propellers, and ships them to over 140 countries. You will be hard pressed to find better pricing on Michigan Wheel boat props. If you need assistance in selecting the perfect boat propeller, contact the experts at Propeller Depot.